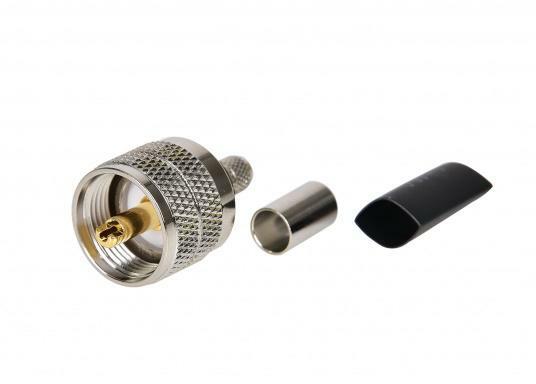 The GLOMEX RA353 is a solid PL259 connector for RG8X antenna cables. It is ideally suited for trimming RG8X FME antenna cables within the GLOMEASY series to individual lengths or to route antenna cables. €6.95 Incl. tax, excl. shipping. The GLOMEX RA353 is a solid PL259 connector for RG8X antenna cables. It is ideally suited for trimming RG8X FME antenna cables within the GLOMEASY series to individual lengths or to route antenna cables. This connector is a crimping / soldering type. In addition to the connector, the crimp sleeve and a piece of shrink tubing are included in the delivery contents. A soldering iron and a crimping tool with a 0.255" hexagonal prism are required.